EDC won’t let you take anything in that’s not sealed—that includes gum and chapstick. Plan ahead by surveying the prohibited items list and buying three of everything you need for each night of the festival. Here’s the full list of accepted and prohibited items. Figure out what you want to wear ahead of time, and don’t be afraid to go overboard. There’s no such thing as overboard. The only rule: every outfit will end in sneakers. Sandals, flats, and Converse won’t be working for your feet by the time night two and three rolls around. Plus no one wants anyone dancing on their feet if they’re wearing open toe sandals. For both guys and girls, wear the sneakers you wear for running, and no one will blink an eye. In 2015, the line at will call was five hours long in the hot afternoon sun. Buy your ticket far in advance to ensure it’s delivered to you before you get to Vegas. On day one, when it’s light out, walk around with a map and identify landmarks. Pick a meeting spot. Find the non-Port-A-Potty bathrooms in Carnival Square. Find the exit for shuttles and taxis. If you end up at the wrong exit, you’ll often have to walk back the long way because of fireworks hazards. Find Cosmic Meadow, where you can lay on the grass or sit in the bleachers when you’re tired. Get a lay of the land and you’ll thank yourself later when you’re out of your mind tired and ready to go home. Expect service to be bad. Send your iMessages as text messages. Timestamp everything. Take a few pictures, but remember that flash and neon lights are your enemy. Then turn your phone on airplane mode. Shuttles are a one-hour ride each way because of non-highway routes, and some buses aren’t air-conditioned. Waiting to get on the shuttle on the way back to your hotel in the morning could take several hours alone. If you buy a shuttle pass, only use it for the way in and get in line 30 minutes before they start running to guarantee you’ll be on the first bus out. For the way back, take a taxi, which will run you about $50 and 30 minutes of your time if you leave before sunrise. Avoid driving yourself. Parking and traffic are a nightmare no matter when you leave, and cops are lining the roads watching for drivers under the influence. Watching the sun come up over your favorite set is an experience to behold. Beams of light extend across the sky. Mountains pop up on the desert skyline. Experience the glory, stay until sunrise once. The other two nights, leave right before dawn to avoid the exodus and catch a quick cab ride home. 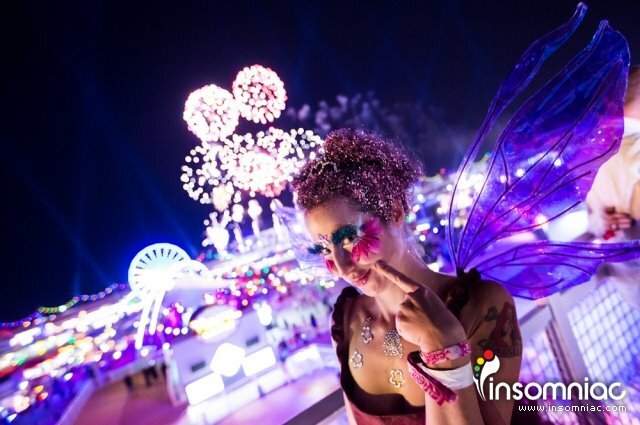 Going to EDC is a trip to EDC, not a trip to Vegas. If you take into account the hours of transportation involved, every night is at least 10 hours out. After that, you’ll be sleeping all day. Think about skipping the daytime pool parties, which will dehydrate you and leave you feeling more tired than usual for the night ahead. If you’re from the area, remember that many of the DJs have Vegas residencies and can be seen outside of EDC weekend. If you really want to check out the Vegas attractions, consider adding more days to your trip. While brutalizing your body with the EDC sleep schedule, remember to stay healthy in other ways. Take your vitamins. Drink more water than you think you need. Eat well. If you have a car, the nearest grocery store or Walmart is 10 minutes away. If you’re stuck walking, Walgreens and CVS are on the strip. Skip your hotel gift shop to avoid astronomical prices. When you slide that festival wristband on, keep it loose enough to slide off again. It’s okay if you don’t make it to night three. Slip off your wristband and sell it to someone to ease the pain.